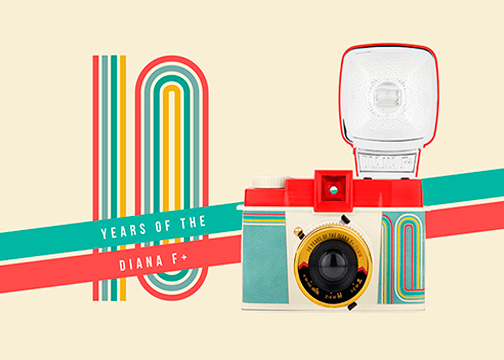 San Francisco, CA—Lomography’s leading lady, the Diana F+ medium-format camera now has a special anniversary look. Inspired by classic 1960’s American diners, the new 10 Years of Diana F edition comes in a stylistic matte red and pastel blue design, complete with a retro gold lens. 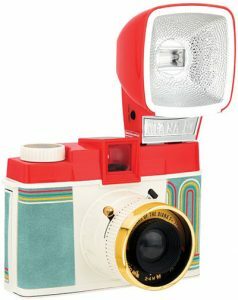 Lomography sought to reinvigorate medium-format photography with a modern reinvention of the cult classic 1960’s Diana camera in 2007. 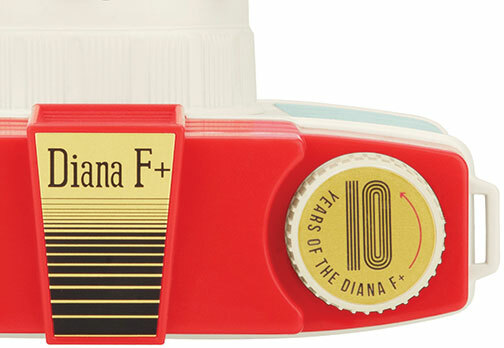 And over the last 10 years, the Diana F+ has won the hearts of die-hard fans. A classic, creative analog camera, the new Diana F+ continues to produces photos on 120 film. And with just 1,500 units available, the 10 Years of Diana edition is a collector’s item. 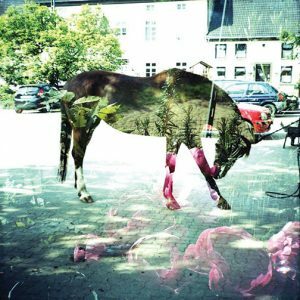 In the last ten years, the Diana F+ has gained popularity due to its dreamy, color-drenched images and a host of experimental features. It’s become Lomography’s certified bestseller. Since its release, it’s shape-shifted 50 times, offering the analog community various colors and reincarnations. Lomography even developed mini mates when it shrunk its size with the Diana Mini and Diana Baby 110. The special anniversary edition maintains the spirit of the classic Diana camera that was a favorite of New York-based artists during the 1980s. 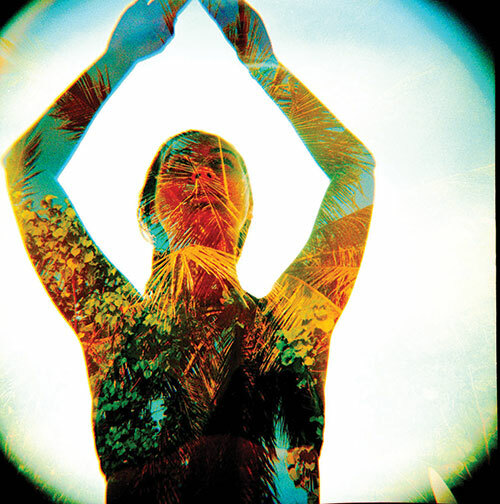 With the same features creatives know and love, Lomography’s Diana F+ anniversary version adds multiple exposures, pinhole and panorama modes, as well as an intuitive zone-focusing system. Designed for ease of use, the lo-fi camera provides two shutter speeds, a shutter lock and a tripod thread. Users can bolster their creativity with a selection of interchangeable lenses, flashes and attachable instant or 35mm film backs. The special edition also features a 75mm standard lens, various apertures (pinhole, cloudy, f/11; half-shade, f/16; sunny, f/22); and zone focusing settings of 1–2m, 2–4m and 4m–infinity. Film advance is via a manual dial-type mechanism. In addition, it offers the following photo formats: 12-shot (5.2×5.2cm); 16-shot (4.2×4.2cm); and endless Panorama (4.6×5.2cm) formats; along with multi exposures. Moreover, the camera’s removable lens allows for superwide-angle pinhole shots. The special edition is also compatible with Diana F+ lenses and accessories. 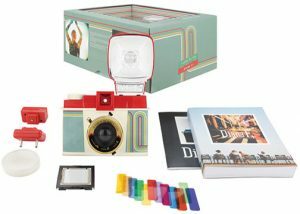 Lomography’s Diana F+ 10 Years of Diana camera is bundled with a 10 Years of Diana filter frame, 12 color gel flash filters, the Diana F+ book, an instruction manual, lens cap, neck strap, hot-shoe connection and format frames. It retails for $89. The Lomographic Society is a globally-active organization dedicated to analog, experimental and creative photography. Through the constantly expanding selection of innovative film cameras, instant cameras, art lenses, film and photographic accessories, Lomography promotes photography as a creative approach to communicate, absorb and capture the world.